Many people replace the front suspension components but neglect the rear - that's not wise. If the rear bushings are worn, the rear alignment can change as the loads change. In this case the rear wheels will steer the car slightly making the car feel sloppy or unstable. 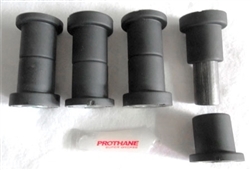 We recommend these urethane trailing arm bushings for both street and track cars. They are the optimal stiffness to allow for adjustability with the IE adjustable camber and toe kits, any stiffer (Delrin, UMHW, aluminum) and the bushing can cause binding. Kit includes 4 trailing arm bushings, zinc-coated steel sleeves (NOT aluminum), and silicone lube. Don't forget to check the rear subframe mounts - they're just in front of the rear wheels where the rear subframe mounts to the chassis. If yours are bad, we have replacements. Designed and made right here in Southern California, we were the first to design a 2-piece trailing arm bushing for this application back in the late 90's.